This Two Tone Vintage Rolex is in fine condition with signs of heavy wear. 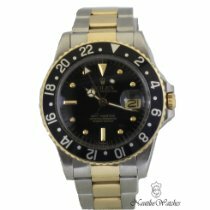 It is made of 18K Yellow Gold & Stainless Steel and has a black dial with custom diamond hour markers. The bezel has signs of age and the bracelet is two tone and measures 8" including case. Model number is 16753 and serial is 852*.